Product #45568 | SKU IFM1III | 0.0 (no ratings yet) Thanks for your rating! 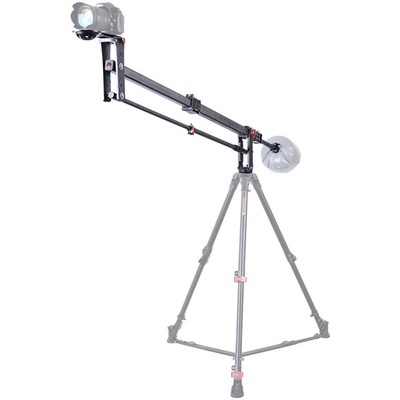 The M1-III Mini Crane from iFootage is a compact, portable jib arm featuring lightweight carbon-fibre construction, a telescoping square-arm tube, and multiple mounting options. Its square tube design helps to minimise potential shaking during operation. The M1-III has a maximum payload of 33 lb in standard mode and 22 lb in low-angle mode. The main jib arm and the counterweight arm each have one telescoping stage (two sections) with locking thumb-lever knobs. Standard barbell weights (available separately) may be used as counterweights. Mount your DSLR (or other small camera) on either of two included quick release plates: the M1 or the Motion X2. The M1 plate has both a flat camera plate and a ball mount, enabling use of a fluid head (with a 60 or 75mm ball). The Motion X2 plate is used with micro cameras or when using wide- angle lenses. Both the arm base and the camera base incorporate 1/4"-20 & 3/8"-16 holes for mounting accessories. The adjustable tilt-damping knob, the tilt lock, and the pan drag function give you added control over your crane shots. For programmable moves, the M1-III can be used with the iFootage Motion X2 or other motion control systems.